It's funny the ways one comes across comic books. Today I was in the kitchen area at work when a buddy/co-worker of mine asked if I went to comic-con. Oh sure...a guy wears glasses, talks about comic books, has comic book art in his cubicles, Marvel superhero modules on his desk, and dresses up like Spider-Man every other Monday and we all just assume he went to comic-con? Anyway, I rolled up my Spidey-mask, took a sip of my coffee and respectfully said I did not (I then rolled the mask back down). Being the nice guy he is, my pal (K-Burns) said his friend went to comic-con and gave him a bunch of free hand-out comics thinking he may want to start getting into comic books. My bud thinks comics are for nerds, and...well, long story short...I have them now. In the small pile of comic books was one 2nd printing of an issue that looked promising. 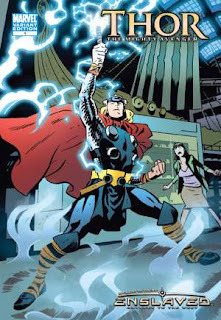 Thor: The Mighty Avenger #1 was most likely created to generate some extra buzz leading up to the movie, which had footage to premier at comic-con. I gave the book a read and it turned out to be kind of charming. I know what you're thinking..."charming?" The comic of the day had a smirking Thor, a mild mannered yet adventure seeking Jane Foster, and the goofy strength-enhanced Hyde villain. Thor was made out to look like a crazy bum in a odd get-up, and he even got beat-up by a villain Thor can take any day of the week! Well, except Sundays. That's the sabbath. The "charm" of the book really comes across in Chris Samnee's art. His very simplistic style, with a focus on facial expressions (which at times remind me of facial expressions from Nickelodeon's Avatar: The Last Airbender), really brings out the tone of the book. In a time when many superhero books are dark and violent, Thor: The Mighty Avenger #1 presents a story that can just be fun and not too serious.